I love food from the part of the world that is the Mediterranean and luckily here in the Triangle we have many options, the latest being Sassool in Cary. I enjoyed a wonderful lunch there today with a group of foodies from the area and ordered their sampler plate of four salads. What a colorful and healthy meal. 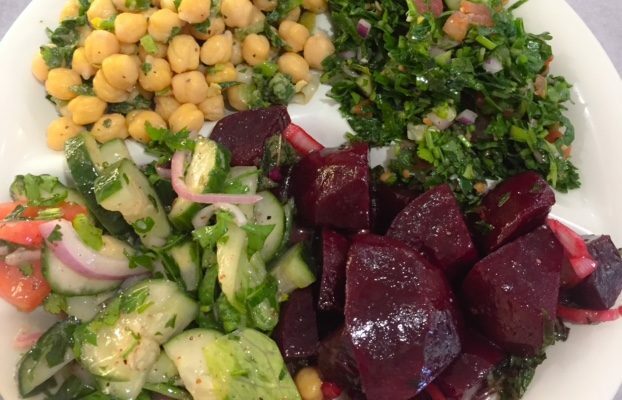 My salad choices were chick pea, tabouli, beets and fattoush. All were flavorful and delicious although the fattoush was not authentic as it usually is a salad of toasted pita bread with a combination of radishes, cucumber, tomato and mixed greens. Theirs was without the bread and radishes, so technically it was a mixed green salad, still very good. They had many options for cooked foods such as kabobs, falafel, shawarma and even a lasagna on the menu. I will return for lunch or to take food home for dinner. The atmosphere is casual, cafeteria style with a few outdoor tables.